The Rogue Valley Veterinary team promises our complete dedication to you and your pet. We will work in cooperation with you to provide the best possible health care for your best friend. We vow to always approach your family member’s care and treatment with honesty and respect. 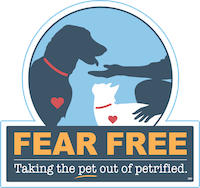 We’re AAHA and Fear Free Certified!